Jerome P. Schreiner, 80, of S. Garfield Avenue, Port Washington died Wednesday, July 13, 2005 at Heritage Nursing and Rehabilitation Center in Port Washington. 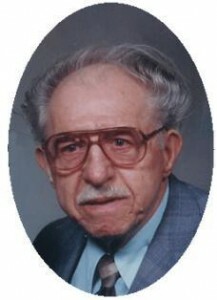 He was born July 31, 1924 to Ann Roden and John Schreiner, Sr. in Port Washington. Raised in Port Washington he graduated from St. Mary’s School. He met Elaine Maas of Sheboygan, Wisconsin and they were married at St. Mary’s Catholic Church in Port Washington on February 7, 1948. He worked as a welder for the former Kwik Mix / PCM / Trac Manufacturing in Port Washington for 43 years, retiring in 1989. Jerome was a member of St. Mary’s Church and an usher for many years. He was also in the International Association of Machinist, Local 1430 since 1952 and a member of the Van Ells-Schanen American Legion Post 82, Port Washington for over 60 years. He was handy with tools, making many bird houses and childrens wooden toys. He also enjoyed gardening. He is survived by his wife Elaine, children Anthony (Ann) Schreiner of Black Earth, Wisconsin, Teresa (Don) Bader of Cedarburg, JoAnne (Richard) Zelko of Sheboygan and Cindy (Joe) Fellenz of Waubeka. Further survived by 15 grandchildren, 4 great grandchildren, son-in-law Ronald Cummings of Nanuet, New York, nieces, nephews, other relatives and friends. He is preceded in death by his daughter Rozanne Cummings and siblings Loetta Hoeft, Marie Didier, John and Bernard Schreiner. The Rev. Allan Sommer will celebrate Mass of Christian Burial 5 PM Tuesday, July 19, 2005 at St. Mary’s Catholic Church, 430 N Johnson Street, Port Washington. Entombment parish cemetery with military rites by the Van Ells-Schanen American Legion Post 82, Port Washington. Visitation from 2 – 5 PM Tuesday AT CHURCH with a 2 PM rosary service.